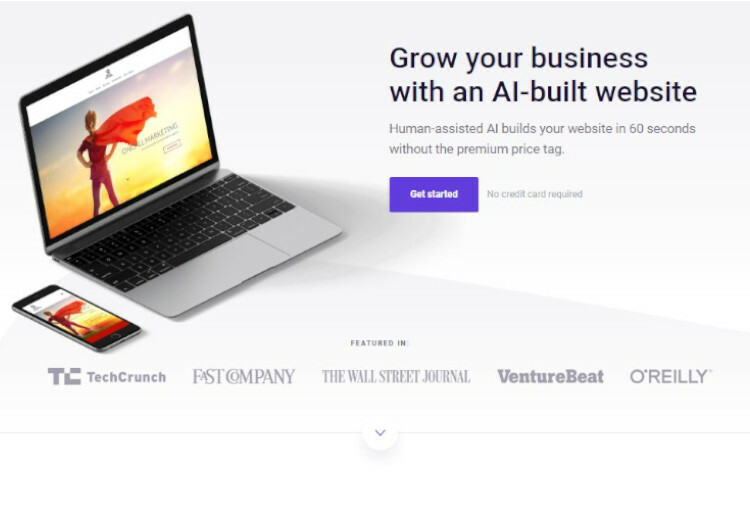 B12 is an artificial intelligence (AI) backed automatic website builder and website design agency that combines cutting edge technology with expert human overview to develop websites in a fraction of the time that it would otherwise take. Using B12, customers can have a draft version of their website ready for review in just 60 seconds. B12 is ideal for companies that need to get up and running with a functional website quickly. Using B12, customers can receive a fully functional custom draft of their website in just 60 seconds. Once the AI-backed builder has done its initial work, the company’s design team can take over the process of tweaking the design and layout to exactly match the customer’s needs. Typically, the entire design process can be completed in 3-to-7 business days—far quicker than the turnaround times that many design agencies estimate. Additionally, the website builder includes a growing suite of tools that help customers ensure that their website is performing as well as possible. This makes it a great choice for a small company that doesn’t have all the expertise it needs in house to make informed decisions about optimizing its site. For instance, the platform features an analytics and SEO tool, as well as a tool for easily importing assets and copy from existing websites. B12 is a great solution for clients that are prepared to entrust some aspects of the website design process to an AI bot in order to speed up production. While we’re not quite at the point yet where pixel-perfect websites can be built entirely by machine-learning-backed algorithms, working with a design agency that uses a bot for some of the design process, and then brings in the expertise of real-life human experts, is a good happy medium that will suit a lot of businesses. B12 represents a great compromise between speed and quality and is already enjoying a lot of success helping small businesses to get their websites up and running quickly—often in less than a week. Ecommerce: B12 makes it easy to connect websites with popular Ecommerce platforms such as Shopify or Ecwid. Multimedia support: Using B12, it’s easy to add rich multimedia content, such as audio and video resources, to designed content. Import assistance: If your business has an existing website and you have content and assets that need to be imported, the process is made substantially easier thanks to the easy import feature that is part of B12. Custom code: If you’re more than a novice at developing websites, you’ll be eager to take advantage of B12’s built-in feature for adding and editing custom CSS and HTML. The ability to directly edit websites’ markup and style sheets means that even if the AI-generated design (or that of the agency) isn’t exactly suitable for the customer’s needs, their in-house resources have the ability to easily customize the look and feel of the site. Easy integration with third-party apps: If you’re a fan of adding Facebook or Twitter widgets to make it easy to show off your company’s social engagement—or you just like Calendly’s ability to easily create appointments on your calendar—then you’ll love B12’s integrations. B12 has a very limited free plan, which is more of a trial to see how the product works than an actual workable solution for a small business—particularly because it doesn’t include a custom domain. To actually build a website that you can viably use for your business you'll have to opt for 1 of 4 paid plans. All of these plans give you a mobile-optimized, AI-built website with a custom domain, unlimited bandwidth and storage, chat and email support, and monthly recommendations on how to improve your site's performance from B12 experts. In addition, all 4 paid plans include bookings, by which visitors can schedule time with you directly on your site, and a contact manager, which allows you to manage contacts, forms and messages all in a single place. All of the above features make the $29 per month “Get Online” plan a decent bargain, despite the one-time setup fee you'll have to pay. All of B12's paid plans include this setup fee which varies by project and includes the cost of your initial design and copywriting needs. For $59 per month, you can sign up for the “Get Integrated” plan, which gives you all of the same features you get in the lower-tier plan, plus phone support and third-party integrations. The aptly-named “Get Found” plan adds search engine optimization (SEO) for $99 per month. The top tier “Get Found Pro” plan incorporates a monthly blog post with relevant keywords to boost search engine rankings for $249 per month. These plans are pricier than many do-it-yourself website builders, but they give you a level of ongoing support and optimization help that those builders don't offer, making it a good fit for businesses with more marketing needs. For even more marketing help, you can pay an extra $45 per month for a built-in, AI-enhanced email marketing suite. B12 keeps on top of trends in SEO and periodically advises clients on changes they can make to their websites to ensure that they have the best chance of indexing well in major search engines. The company’s team of designers stay in touch with companies after their websites have gone live to give them additional advice and to make sure that their websites have met their expectations. The content of your automatically initiated website, including adding and removing multimedia content like embedded audio resources and videos. The CSS and HTML code gives users complete control over the final look and feel of their site. Add-ons to the website such as third-party integrations and widgets, including Calendly and popular social network embedded objects. B12 allows users to easily add popular payment gateways such as PayPal to their websites. The Ecommerce features on-offer also mean that integrating with popular Ecommerce platforms such as Shopify is quick and easy. B12 features built-in tools to help users quickly optimize their website for SEO purposes. The company’s team of experts is also always keeping abreast of changes in the SEO landscape and periodically sends users advice on what they could be doing to further optimize their websites. Launching a website can be a daunting process, which is why it’s great that B12 has put good effort into developing some competent support resources to help users out with any teething issues they might run into as they get started. The main customer support services are provided via email—so users can create a ticket at any time simply by clicking into their inbox. The team also promises to keep in touch with users after they have developed their sites to provide helpful recommendations about changes that might benefit their websites. B12 is a great option for small businesses that want to get online quickly. After an AI-generated mockup, which can be produced in under 60 seconds, B12’s in-house design team takes over and works with clients to make sure that a great websites is ready to go online. The whole process can be wrapped up in 7 business days. Custom CSS and HTML editors, and a raft of third-party add-ons, means that the websites don’t lack power. B12 has created over 20,000 websites on behalf of clients, so it’s got some impressive experience to boast about. The team of 25 members is based in New York City. The company enjoys the backing of over 20 investors and has an all-star advisory team comprised of professors from Stanford and MIT. In fact, the advisor list is something of a “who’s who” of the tech world, featuring names such as Grammarly co-founder Alex Shevchenko and Greg Brockman, the former CTO at Stripe. Nitesh Banta is the company’s current CEO and Co-founder. He has been at the helm for 4 years.